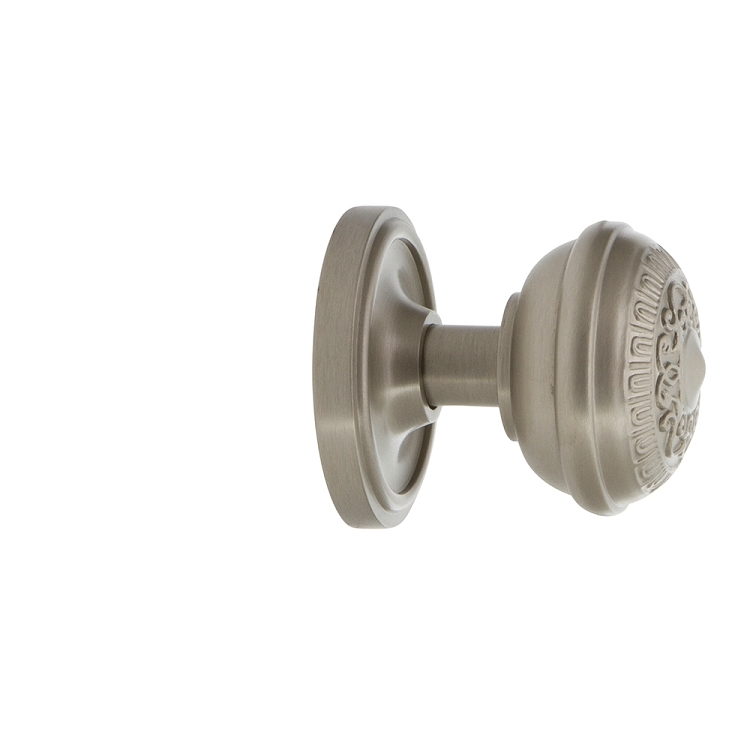 Nostalgic Warehouse reproduction egg and dart knobs are a great solution for obtaining that antique door knob look, with the convenience of components that fit modern style doors. 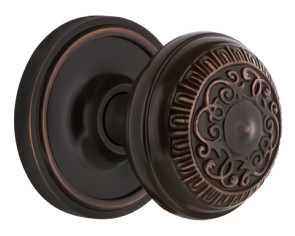 Customize your egg and dart knob with multiple finishes above. 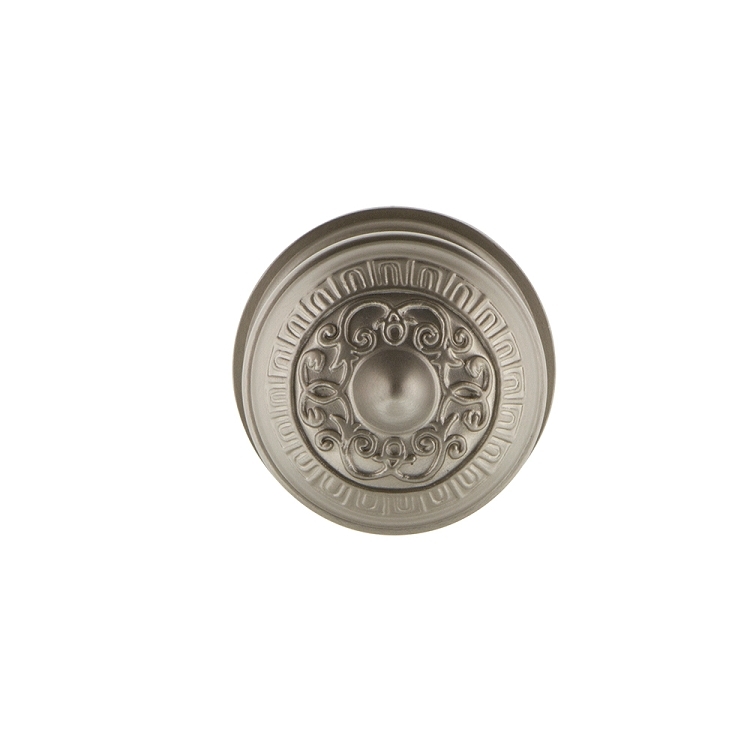 - Dimensions: Knob: 2.25" Diameter- Rosette:2.5" Diameter. 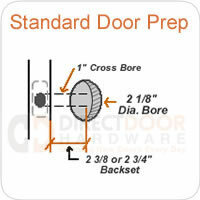 For exterior doors we recommend using a passage function knob in conjunction with a Nostalgic Warehouse Deadbolt above. Crystal or porcelain knobsets are not recommended for exterior use and are not covered under warranty if used for that purpose. Note: Nostalgic Warehouse door hardware is shipped standard with square corner strike and faceplates. Rounded corner strike and faceplates are available upon request. Drive in latches also available upon request. 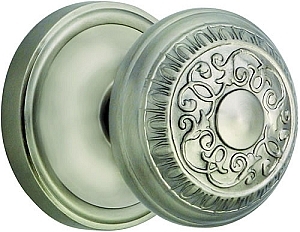 Nostalgic Warehouse door knobs are available in different functions. Please review the descriptions below so you can order the correct door knob function for your application. 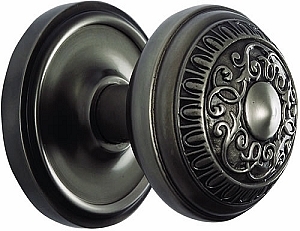 Nostalgic Warehouse Passage or Hall and Closet Door Knobs are used on doors that do not need a locking mechanism. Halls, closets, pantry or laundry doors will typically fit this function. 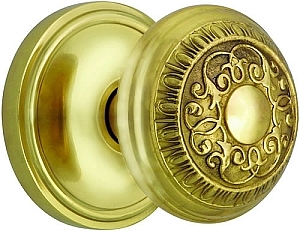 Remember, Passage door knobs do not have a locking mechanism. 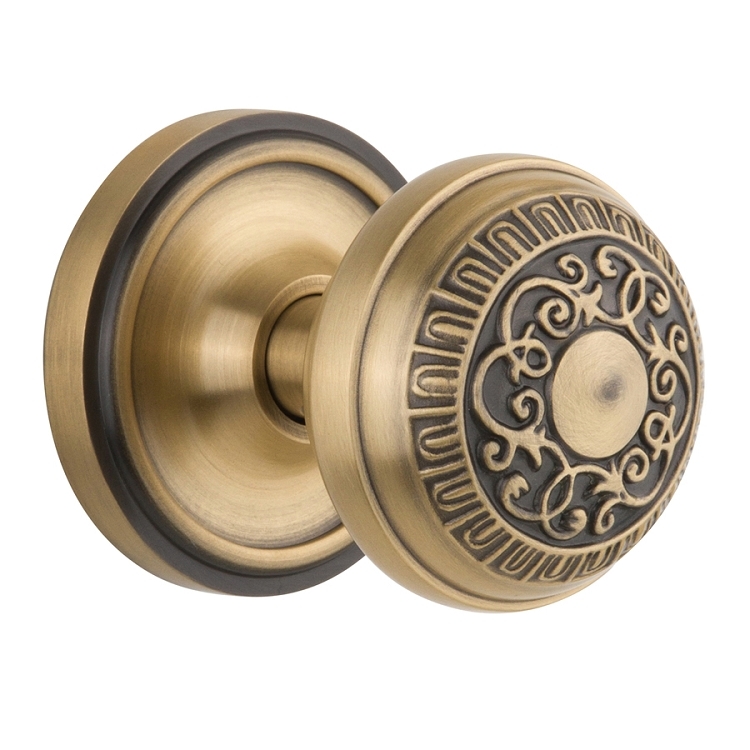 Nostalgic Warehouse Privacy or Bed and Bath Door Knobs are typically used on Bedrooms, Baths or Office doors where a lock for privacy while occupied is desired, but a keyed lock is not really necessary. 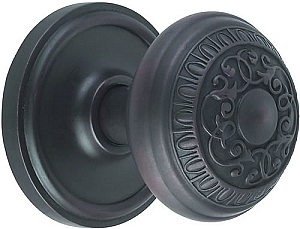 Nostalgic Warehouse privacy door knobs have a push button on the rosette or backplate as shown to the left to activate the lock. On the outside, there is a pin hole for emergency unlocking. Some door knobs will have a pin hole inside a circular piece, while others just have a small pinhole. 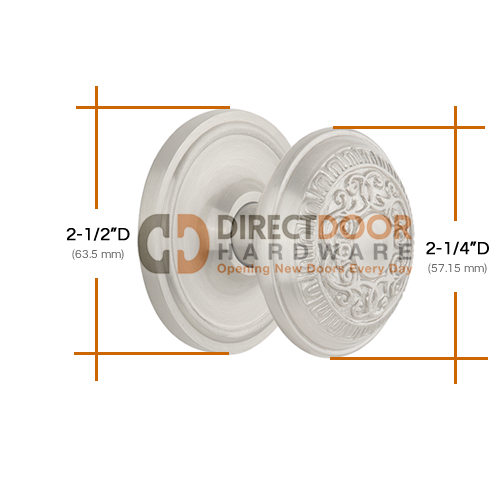 Nostalgic Warehouse Double Dummy Door Knobs are sold in pairs. 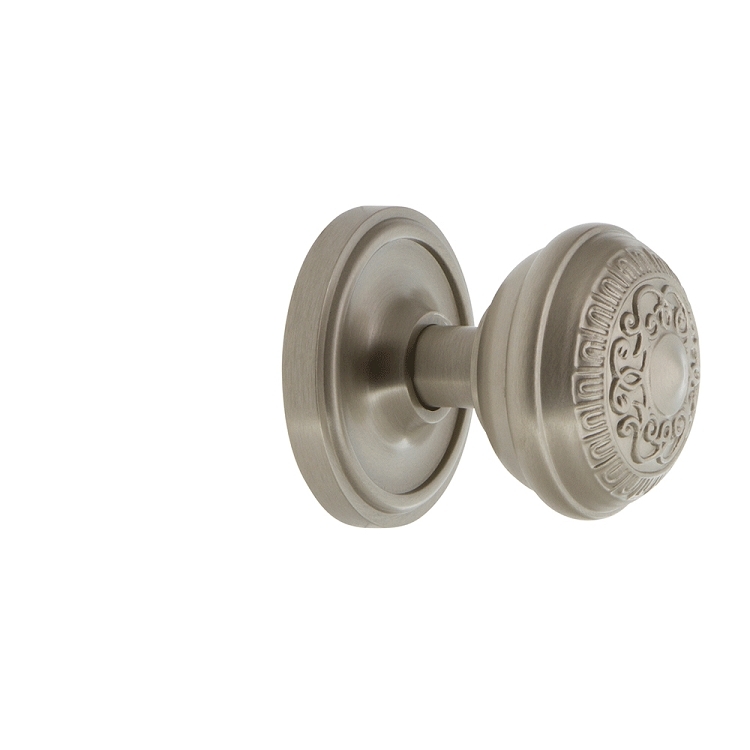 Dummy door knobs do not have a latch or mechanism of any kind. These door knobs are surface mounted to a door that has not been bored (large hole cut out) for a door knob. Dummy door knobs are generally used on double doors that use a ball catch at the top to keep them closed so a latch is not required. They are also usually found on the inactive side of a french door - a single dummy mounted on either side of the inactive door.